This election campaign may be fascinating to the experts but it is almost guaranteed to irritate if not infuriate members of the public, as we saw when last night’s Question Time audience met the three leaders one by one. They could have been interviewing them for a job, in which case, they might have concluded that the job needed to be re-advertised and that ‘previous applicants need not apply’. Cameron’s “curious lack of energy and belief” (Daily Telegraph) has now given way to “pumped up” passion in shirt sleeves (Sky News). 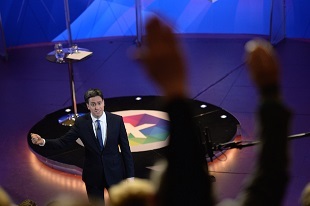 Miliband appears to have been cornered into insisting that he would rather stay in opposition than deal with the SNP. The Lib Dems leak a document which they claim proves that the Conservatives are planning savage cuts aimed at the poor, yet they appear to rule out a Coalition with Labour if they turn out to be dependent on SNP votes. And what do Liberal Democrats make of David Cameron’s ‘red line’ on the Referendum on Europe? Could that be their own red line? No wonder the public feels that something is being kept from them. Much political communication research finds that politicians over-estimate the role of the mass media, and especially newspapers, in influencing voter attitudes and behaviour, and this continues, despite the rise of social media. The evidence given by many politicians to the Leveson Inquiry (1) reads like a litany of fear, even terror, that a media frenzy could, in the words of Tony Blair, at any moment, “literally wash a government away”. Yet their own over-use of crisis narratives in this campaign – note constant claims of ‘Labour’s debt crisis’, and ‘David Cameron’s A & E crisis’ – threatens to further undermine public faith in politics to deliver solutions. Which reminds me of David Cameron’s 2010 poster “I’ll cut the deficit, not the NHS” – in itself a strangely contradictory slogan. What has happened to all the billboards? Well, it seems that the days of the powerful election image are over now that they can so quickly subverted on line. At a panel discussion about the election at the Mile End Institute event at Queen Mary, University of London on 29 April , the celebrated elections scholar, Professor John Curtice, stated that, in this election, much party campaigning had moved on to social media, and is being conducted secretly and invisibly and at great expense. He was responding to a comment by fellow-panellist, Andrew Cooper, David Cameron’s former Director of Strategy and founder of the polling company, Populus, that the Conservative party had broken tradition this time by spending its substantial election budget on targeted social media activity rather than billboards. He wouldn’t go into detail but he did say that, under the guidance of Jim Messina, Obama’s former deputy chief of staff, the party is quietly targeting individuals through their social networks. Together with Lord Ashcroft’s multi-million pound polling in marginal seats, this looks like a deeper application of personalised marketing than we have seen before in this country. Strangely enough, the influence of the partisan mass media in influencing campaign rhetoric was barely touched on during the discussion at the event. There were claims of a struggle on the part of the established parties to connect with voters which is clearly failing – a failure which in part explains the triple surge of UKIP, the Greens and the SNP. According to Cooper, both main parties are fighting “very safe, very lifeless, very risk-averse campaigns which have failed to spark”. On UKIP, he said, the Conservatives had “thrown the proverbial kitchen sink to get back those UKIP votes”, but nothing had worked. He even described David Cameron as a recruiting sergeant for UKIP. The panel chair, broadcaster Robin Lustig, described it as “an extraordinary and bizarre election campaign”, in which no party is prepared to be honest enough to say “something’s got to give”. The Telegraph’s Mary Riddell agreed: “Party leaders are stoking up more disillusion and disquiet by making promises they won’t be able to keep after the election”. Curtice added that they were failing to articulate a broad vision, and coming up with too many “policy wheezes”. The reasons why politicians may be behaving in this way were not discussed, but fear of ridicule arising from widely publicised ‘gaffes’ such as Gordon Brown’s encounter with Gillian Duffy in 2010, must be on their minds. Who believes that David Cameron is really an Aston Villa fan? For John Curtice, this election is fascinating because it is qualitatively different to any other. Tony Blair’s claim that elections are won on the centre-ground will not apply this time, and it is questionable as to whether ‘British politics’ even exists any more. Both Labour and the Conservatives now have enemies to their left and right, while in Scotland, the SNP is polling close to 50%, and will win against a divided opposition under first past the post (FPTP). According to Mary Riddell, the likelihood of a second indecisive election, and possibly a minority government, would put the future of the UK’s election system in doubt, including FPTP. Robin Lustig referred to the low opinion among voters of politicians as a class, fuelled by the MPs’ expenses scandal, the failure to find weapons of mass destruction in Iraq and the 2008 banking crisis, and suggested that disgust may be a better description of public feeling than disillusion. The media are rightly lauded for their role in holding power to account, but the drip-drip effect of day to day negative coverage, the endless attribution of blame, and tribal conflict within and between political parties, leads in the long run to a disastrous loss of credibility. From the point of view of the public, who are largely bystanders, politicians and journalists appear to inhabit “a world of their own, distristful of one another and seemingly not interested in the welfare of the public at large”(2). It may be true, as Colin Hay has claimed, that, in politics, “the language of crisis has become cheapened” (3), but after May 7th, these bizarre events might be about to “signal the unsustainable nature of the conditions that precede them” (4) and lead to the kind of real change that many were expecting after the financial crisis of 2008. In the meantime, we can look forward to an unpredictable night on May 7th/8th. One of the most interesting seats to watch, according to John Curtice, will be Sheffield Hallam, where Nick Clegg, who is defending a majority of 15,284, faces a Labour lead in Ashcroft’s latest poll of just 1%. What happens to Nick Clegg could have a decisive effect on possible Coalition negotiations. Ruth Garland is a researcher and PhD student in Media & Communications at the LSE having returned to study after 25 years working in media relations in publishing, broadcasting, public health and local government, during 13 years of which she was a job sharer. She is researching into government communications. 1. Leveson, B. (2012) An Inquiry into the Culture, Practices and Ethics of the Press. London: The Stationery Office. 2. Negrine, R (2014) . A Crisis of the Media, in D Richards (Ed) Institutional Crisis in 21st Century Britain. Basingstoke: Palgrave Macmillan. 3. Hay, C (2014) A Crisis of Politics and the Politics of Crisis, in D Richards (Ed), as above. 4. French S, Lyshon A (2010). Commentary. Environment and Planning. 42, 2549-2559.